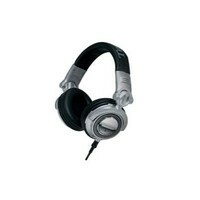 Technics' RP-DH1200 DJ Headphone were made to satisfy the needs of DJs, whether they're working the decks at a show or in the studio working on their next remix. Their closed-ear designs ensure that you hear every note in a live situation, and the folding swing-arms allow for one-sided monitoring. The Technics headphones also have a padded neck band for added comfort and 24k gold-plated stereo plugs for flawless contact. They're also made to handle very high volumes.